Donald Trump, like many nominal Presbyterians, is lost. Everything about his public statements and behavior indicates that, if he died today, Trump would spend an eternity in Hell. This, in and of itself, should concern believers and arouse not their scorn but their compassion. Regardless of how Trump is viewed as a political candidate, his lostness should be of utmost concern to the children of God. The same is true for Hilary Clinton who seems as nominally Christian and spiritually dead as Trump. Yet the lostness of these two souls seems to be of little concern to many politically-minded professional talking-head Christians. 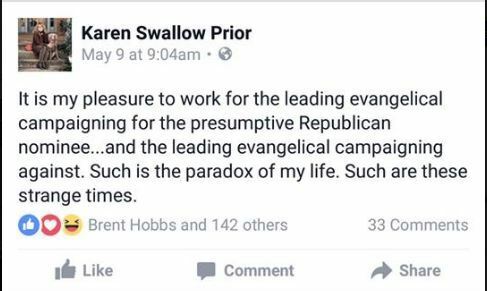 Liberty University professor, Dr. Karen Swallow Prior, made a recent post on Facebook that seems to illustrate this very clearly. The first “leading evangelical” to whom Prior refers is Jerry Falwell, Jr. Falwell is the President of Liberty University, which claims to be “the world’s largest Christian University.” The school’s official motto is “Training Champions for Christ.” However, the school motto could arguably be “Training Champions for the GOP.” The 2012 Republican nominee, Mitt Romney, was conferred an honorary doctorate by the school and invited to speak at that year’s commencement ceremony. In January of 2016, Jerry Falwell Jr. endorsed Trump for the Republican nomination after giving him an opportunity to speak in front of Liberty’s thousands of students. That the son of a televangelist would endorse Donald Trump should have come as no surprise to Russell Moore, who once pronounced that Trump was the leader of the “Jimmy Swaggart wing” of evangelical voters. Russell Moore is the second “leading evangelical” to whom Prior referred in her statement. Moore is the President of the Ethics and Religious Liberty Commission of the Southern Baptist Convention (ERLC) at which Prior is a research fellow. Strangely enough, at the time of her appointment to the ERLC, Prior referred to Moore’s organization as a “respected and unifying voice in a fractured culture.” However, Moore seems to be anything but. He’s alienated many evangelical voters by his frequent and public vehement attacks on the character and political outlook of Donald Trump (and his supporters). Moore even published an opinion piece in the Washington Post stating that he’d ceased describing himself as an “evangelical” and that the current election had led him to “hate” the term. Moore is a professional lobbyist; his job is to lobby Washington, DC for the Southern Baptist Convention. Unfortunately, he’s provoked and upset the USA’s most prominent Republican politician, Donald Trump. If Trump is elected to the office of President of the United States of America, it looks like it would be very hard for Trump to work with Moore. An embittered Trump, beset by unrelenting provoke from Moore, referred to him as a “terrible representative of Evangelicals and all the good they stand for. 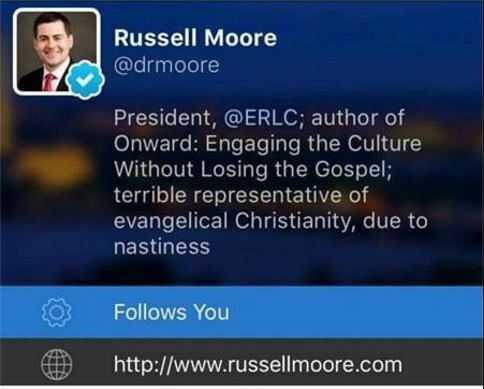 A nasty guy with no heart!” This is a proclamation that Russell Moore has chosen to own in a very impish way. Below are pictures from his Twitter profile and Instagram account. This is not how an “evangelical” should respond to the barbs of a lost person. What “evangelical” ultimately stands for, despite this year’s electoral embarrassments, is sharing the good news of Jesus Christ. Being evangelical means loving one’s enemies, not poking at them and trying to get their goat, which Moore is clearly doing here. How is it that an a highly compensated, highly-educated, high-profile employee of the world’s most prominent evangelical denomination, the Southern Baptist Convention, acts like this in public and gets away with it? Where Moore’s concern for Donald Trump’s damned soul? Where is Russell Moore’s witness to the good news of Christ? Has Moore forgotten that he’s a professional Christian, not just a professional lobbyist? Mix politics with religion and you get politics. You get Liberty University’s conversion by front runner status and Russell Moore’s backhanded derision. 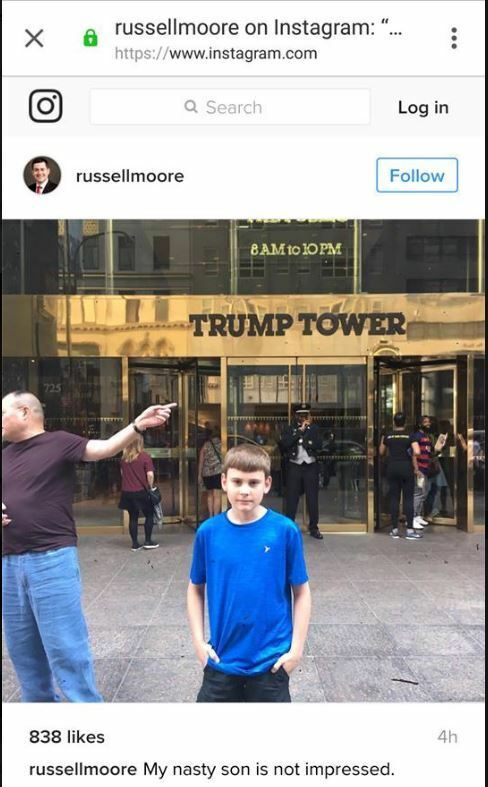 How much longer are Southern Baptists going to put up with a leader like Russell Moore? How much longer is the Internal Revenue Service going to let Moore’s clearly political organization fly tax exempt under its radar? Russell Moore has shown outright contempt for a lost person, Donald Trump, because he is a political adversary. This is exactly why Christ’s Church does not need professional lobbyists like Moore. Christ’s kingdom supersedes American politics. Hell is enough scorn for the lost. Evangelical Christians should show love and compassion to the lost in the hopes that they will escape God’s wrath. They should not provide scorn of their own. Rather, they should be…evangelical. This statement refers to Jerry Falwell, Jr. and Russell Moore as the evangelicals for whom she works. As with any statement made by Karen Swallow Prior, one should consider the potential for nuanced meaning. Prior literally works for Jerry Falwell as an employee of Liberty University. Prior figuratively works for Russell Moore as a research fellow at his Ethics and Religious Liberty Commission. Falwell has endorsed Trump but doesn’t literally work for his campaign. Moore has decried the Trump candidacy but is more accurately “crusading” against him. I can empathize, but then, I’m not a professional evangelical leader. Previous story Did An Apostle Just Call You Stupid?